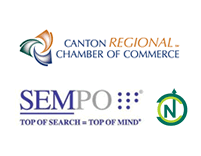 2013 was an interesting year for SEO’s and internet marketing professionals alike. With Google releasing algorithm updates like they were going out of style, even the most experienced experts were left playing catch up. Like every year that passes, the world of online marketing saw a number of new trends and practices emerge and those that were able to persevere are likely reaping the benefits heading into 2014. If you are a business owner or marketing officer and have been keeping up with the latest news and trends in the world of online marketing, then bravo. If you’re like most everybody else whose time and effort is better served managing the ins and outs of running your business, then put on your reading glasses. Let’s take a look at 4 organic search marketing trends for a successful 2014. Content has always reigned supreme in an internet marketing strategy, but now more than ever it’s important to provide valuable content to site visitors. The days of banging out a 300 word article surrounding one keyword and a bunch of fluff is gone. The focus now has become creating “quality” content that is educational, entertaining, and actionable. You should be striving to develop content that the reader wants to print off and hang on their wall. Now that’s probably not going to happen frequently if at all, but I think you’re picking up what I’m putting down. Google is going to start rewarding (or already has) focused content that provides the most value for the searcher’s intent. 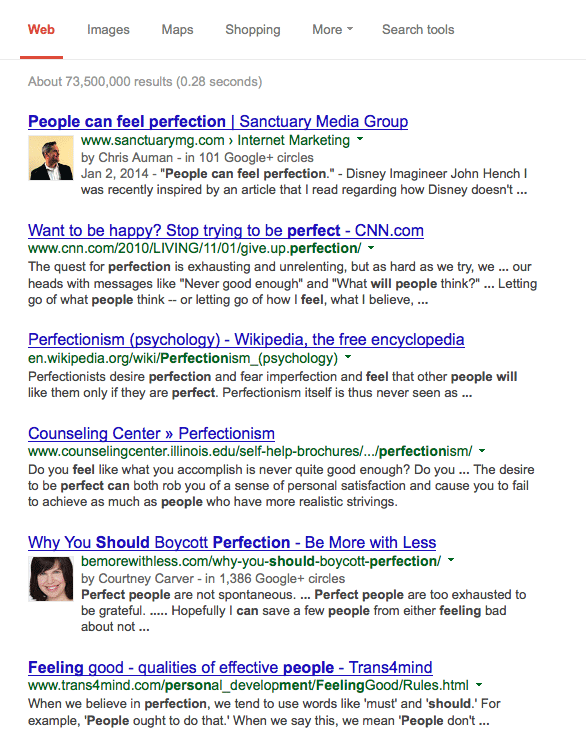 Those informational pieces such as tutorials, how-to’s and long blog posts will be frequenting page 1 of the SERP’s. Speaking of Google, one important update that has taken a stranglehold of content marketing is the Hummingbird update. The Hummingbird algorithm is based on semantic search and focuses on delivering results based on user intent vs. keyword search terms. 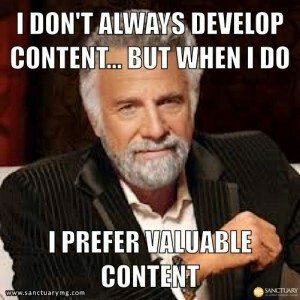 So what does this mean for your content strategy? In a nutshell, it means you should be creating content that answers the questions searchers are looking for. Furthermore, if I didn’t get my point across yet, it means you should be creating robust, quality content that is educational, entertaining, and actionable based on the way people naturally speak. Google Authorship is really starting to catch on and continues to have an importance for business websites trying to gain credibility. 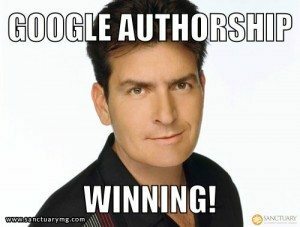 Being a contributor to your site is a great first step, but leveraging that authorship and connecting your published articles and content with your Google+ profile is going to make all the difference. I’m sure you’ve seen search results that show an author’s name and his or her photo, along with their Google+ circles and URL next to it… that’s what I’m talking about! Tell me those results didn’t jump off the page at you. Seriously, tell me. Aside from standing out from the other results, it does have some additional benefits for Google’s algorithm matching searches to relevant, “quality” content. Author classes and authorrank helps ensure that search results are credible and will serve as an indicator of the content’s quality. It’s kind of one of those “help yourself and help your business website at the same time” sort of things. In this case everybody is winning (Charlie Sheen voice). Bottom line is that it’s important. So set up your Google+ profile if you haven’t already, set yourself up as a contributor to your website, and add Google Authorship markup to your site. 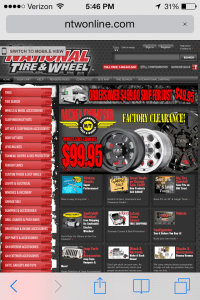 There’s many ways to set this up depending on how you manage your site. Follow step-by-step instructions with this great tutorial. If you didn’t know already, smartphones and tablets are kind of a big deal. The mobile revolution is taking over and is here to stay. In fact, according to Cisco, “By the end of 2013, there will be more mobile devices on Earth than people.” Well it’s 2014 now people, and I’m no mathematician, so you can do the math on that one. Furthermore, Compuware suggested that 57 percent of consumers will not recommend a business with a poorly designed mobile site. Similarly, 40 percent of consumers will go to a competitor’s site after a bad mobile experience. 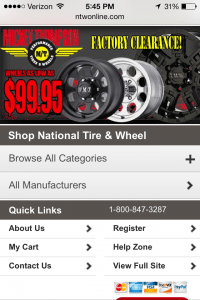 Take a look at the difference a mobile optimized site can make. Which one would you rather shop from? With smartphones and tablets accounting for roughly 30% of organic search traffic, this year’s internet marketing battle could very well be won or lost on mobile devices. 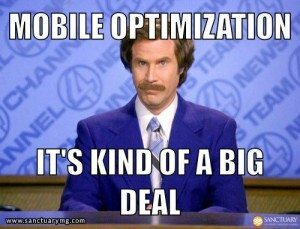 If you don’t already have a website optimized for mobile, what are you waiting for? Whether that is a simple plugin to make your site better suited for mobile or a completely unique design for your mobile site, the fight has already started, so it’s time to armor up! All the buzz in 2013 was about responsive web design… and it still is. Responsive web design is a flexible design that sizes automatically to fit the resolution of the device being used. This ensures your site will fit the size of the screen and presents your design equally well on every device. Many web developers have been slow to adopt this solution, so if you’re a business owner looking to go mobile make sure you have that conversation with your website developer. Try not to ignore the huge elephant in the room. If you’re not already actively engaged in social media it would be a good idea to start. As mentioned earlier in my post, search engines are seeking to return quality content that is relevant to the search intent. Social shares along with other social signals are becoming more and more prominent ranking factors. Therefore the more social shares, Google +1’s, etc. your content has, the better position you’ll be in to rank organically in the search engines. Bottom line is that the more people share your content, the more authoritative you’ll be viewed in the eyes of Google. 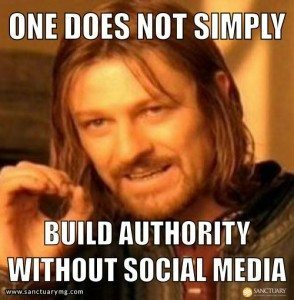 Building authority in your niche will be key moving forward. Growing your following and redistributing your content through these social platforms will increase the likelihood of having your content shared. In addition to the potential sharing implications, I have a pretty good feeling Google knows who’s active and who’s not and is rewarding those businesses with a good following. Redistribute your content, but don’t forget to add social share buttons to your website to make it easy for visitors to share your content with their friends. Organic search marketing in 2014 is sure to have its twists and turns and more exciting discoveries ahead. Working on these trends is a good start, but there are countless other best practices not covered here that you should be working on as well. Don’t put all your eggs in one basket. 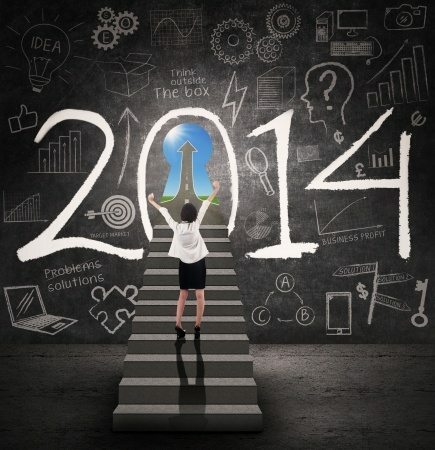 A blend of these tactics along with your other marketing efforts is the key to your online success in 2014. If you haven’t already started taking control of your online presence, the professionals at Sanctuary can help. Contact us for a free assessment and get a jump start on your new year’s resolution. I’ll toast to that! Tom Murphy is an Online Marketing Strategist at Sanctuary. With experience helping hundreds of clients improve their online footprint, Tom has the knowledge to adapt to many industries. If Tom was a thing, he would be the ultimate Swiss Army Knife.